Power(s) given Can breathe fire that can destory red blocks, survive lava, fall through thin platforms. Dragon Wario is the seventh disguise Wario obtains in Wario: Master of Disguise. He can assume this form after finding the Dragon Guise Gem in Sneezemore Cave during Episode 4. 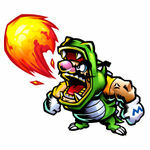 Dragon Wario can breathe fire, which is controlled by using the Touch Screen. The fire is used to attack enemies and destroy red blocks. Dragon Wario is also able to survive in lava without the aid of the Sweatmore Hotpants. Due to Wario's extra weight in this form, he has a low jump height and falls through Semi-Solid Platforms. Wario can make this form more powerful by collecting red gems. After obtaining the Dragon Mastery Gem in Episode 9, Dragon Wario's fire turns blue, allowing him to destroy blue blocks. This page was last edited on February 18, 2019, at 01:13.